Increase visibility and predictability into your overall business performance. Sugar’s Forecasting is designed for the individual user as much as for the decision maker. Get comprehensive and detailed view of your pipeline and make data-driven decisions. Easily view sales quotas at the individual, team, and sales organization level. Use Sugar’s Forecasts to model best case, likely, and worst cases scenarios. Users can see in real-time how they are performing against their quotas and adapt quickly. Get real-time visibility and track your top performers. Sales managers can use Sugar’s drill down capabilities to track and guide their sales reps. Easily track team progress from a single forecast worksheet and assign quotas easily. Use what-if scenarios and build better predictability. Sugar's Forecasts incorporates revenue line item records to build forecasting worksheets and predict sales. With Sugar Enterprise, you can drill down to the revenue line item level, across single or multiple time periods. 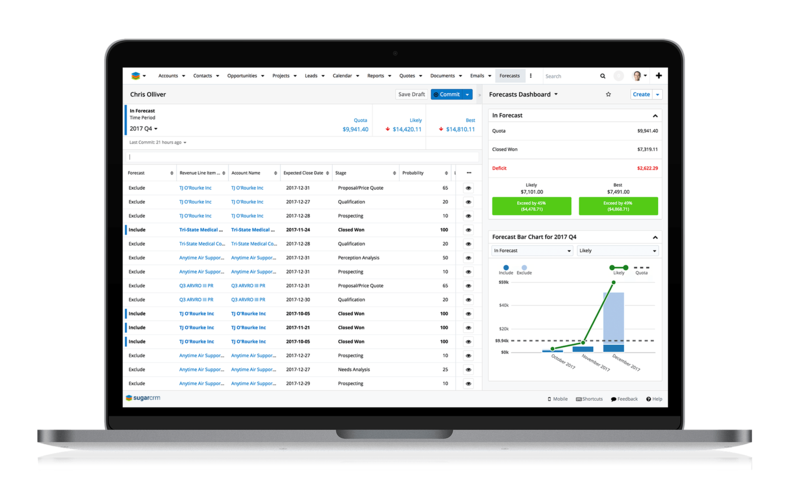 Track even your most complex sales with Sugar Forecasts. Customize Sugar to build forecasting for your customers who buy a variety of products or services in recurring, extended, or staggered purchase cycles.